Bears the title of the guardian of summoners. 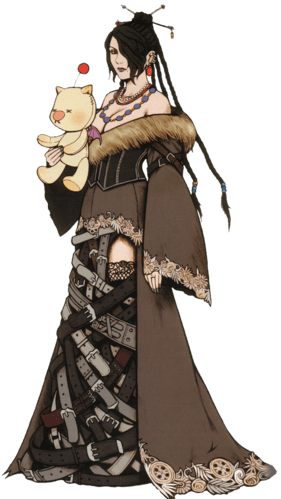 Prior to Yuna’s pilgrimage, Lulu had already been a part of two others in the past. Unfortunately those pilgrimages bore unfortunate results which haunt Lulu. She resided in Besaid along with Wakka and Yuna. They get along with Yuna and treat her as a younger sister. She became Wakka’s brother’s lover, until his untimely demise during the war against Sin. It may seem that she does not show any emotion when talking to others, but she is actually warm. Apart from presiding over Summoners who undertake their pilgrimage, her mastery over Black Magic knows no bounds. Demi Deals 1/4 damage to all enemies’ HP. Lulu’s overdrive is unique in that it takes the form of another Black Magic spell. When under the effect of Overdrive, Lulu’s Black Magic will not consume any MP. With Fury, she gains 4 seconds to rotate her spells.